Aric Almirola and the No. 10 Smithfield Ford Fusion team for Stewart-Haas Racing (SHR) soldier on with the “NASCAR Goes West” swing of the 2018 Monster Energy NASCAR Cup Series schedule. Sunday’s Auto Club 400 at Auto Club Speedway in Fontana, California caps off the three-race stretch of the schedule. It’s been a successful run so far for the No. 10 Smithfield team in the western part of the United States with two top-10 finishes for Almirola. Most recently, he completed the 312-lap race on the mile oval at ISM Raceway near Phoenix Sunday with a seventh-place finish, his highest finishing position of the season. The event also marked the first time in SHR’s history that all four entries completed a race in the top-10. The No. 10 team once again persevered through the weekend at Phoenix with Almirola behind the wheel and crew chief Johnny Klausmeier calling the shots. The duo worked together to gain 15 positions from Almirola’s 22nd spot on the starting grid by the time the checkered flag flew. The seventh-place finish helped the Tampa, Florida native improve one spot to 10th in the driver standings. Heading to Fontana, SHR has all four cars in the top-11 in the standings with Kevin Harvick in the lead position after his back-to-back-to-back victories at Atlanta Motor Speedway, Las Vegas Motor Speedway and Phoenix. The latter victory Sunday was the 46th by an SHR driver in the organization’s 10-year history. Almirola continues to surpass his early performance from his previous 10 Cup Series seasons with an average finishing position of 10.2 through the first four races of 2018. This weekend marks his 11th appearance at Fontana, one of two 2-mile tracks on the Cup Series schedule, and he looks to add his first Cup Series top-10 at the track while keeping his recent string of top-10 finishes alive. While Fontana typically provides some exciting racing on the track for Almirola and his fellow Cup Series competitors, the Smithfield driver who turns 34 Wednesday makes it a point to explore the surrounding area when he’s in town. During Fontana weekend, that usually means venturing up to nearby Mount Baldy, which is located in the San Gabriel Mountains. 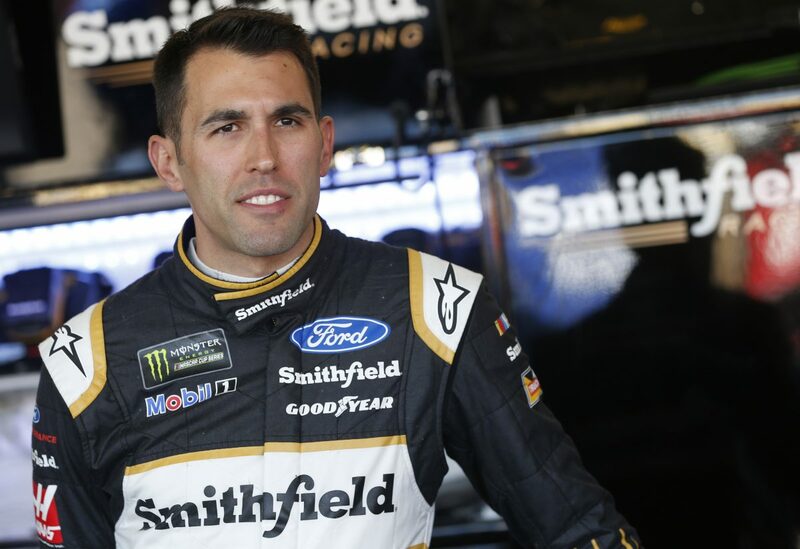 Smithfield, a brand of Smithfield Foods, which is based approximately five hours northeast of SHR headquarters in Smithfield, Virginia, is in its seventh season with Almirola and first with SHR. Fontana marks the fifth consecutive weekend the Smithfield livery has adorned Almirola’s No. 10 Ford Fusion. Founded in 1936, Smithfield is a leading provider of high-quality pork products, with a vast product portfolio including smoked meats, hams, bacon, sausage, ribs, and a wide variety of fresh pork cuts. To this point in the season, Almirola has completed a combined total of 1,109 laps around the first four venues on the Cup Series schedule for a completion rate of 99.8 percent. Coming off four top-13 finishes – 11th at Daytona (Fla.) International Speedway, 13th at Atlanta, 10th at Las Vegas and seventh at Phoenix – Almirola proves he’s found success with the No. 10 team at several styles of tracks – a superspeedway, two intermediate ovals and a short track. In addition to his Cup Series experience at Fontana, Almirola has three Xfinity Series starts with two top-10 finishes and an 11th-place finish, along with five laps led. He also made a Camping World Truck Series start in 2006. Ford has garnered a total of 11 wins at Fontana and has visited victory lane at three of four races this season, giving the manufacturer the top spot in the manufacturer standings by eight points. If a Ford driver captures the victory this weekend, it will be the first time since 2014 that Ford Performance has won four races in a row. Should Harvick win his fourth race in row, it would be the first time an individual Ford driver won four consecutive races since Mark Martin in 1993. This weekend marks Almirola’s 249th career start in a Cup Series car. Next weekend at Martinsville (Va.) Speedway, he will reach his 250 race-start milestone before heading into the season’s first off weekend. What do you look forward to at Fontana? Do you do you have anything outside the racetrack that you like to do in California? Is there a moment at Fontana that sticks out in your mind?